Edge Desserts: Have You Thanked a Teacher Today? First, I would just like to say that I love, love, love my kids' school! They have both been going to the same school since pre-school and I can't imagine it any other way. They are now in 5th and 2nd grade and are absolutely flourishing in every way. The teachers at our school, along with all of the staff (plus some really special volunteers), have been an absolutely blessing for my kids... especially this past year as my kids have adjusted to my divorce from their father. That being said, I wanted to do something special for the teachers this year.... as so often happens, time almost got the best of me, but somehow I managed to get it done. Love, Blessings, and THANK YOU to the teachers! 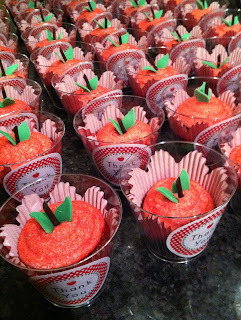 The cupcake - red velvet with cream cheese frosting... coated in red sugar and embellished with an apple stem and leaves... isn't the cupcake paper just too cute! Couldn't believe my luck when I happened upon them in the store.... today! now it's a cupcake to go! OOPS! Apparently National Teacher Appreciation Week begins May 6th! Our school just celebrates it early I guess! Color me embarrassed... But hey... I guess I can re-post in May, right?